The deal comes over 1 and ½ years after the expiration of stadium's first naming rights deal, signed with Pizza Hut upon grand opening in 2005. From now on the stadium will be called simply Toyota Stadium, while neighbouring training centre with 17 football fields is to be named Toyota Soccer Center. 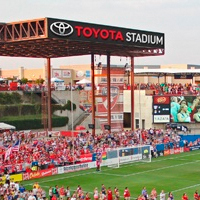 This is Toyota's second naming rights deal in MLS, following Chicago Fire's Toyota Park in Bridgeview. Globally the name is used second time after the Japanese Toyota Stadium. That one isn't sponsored, though, but comes from the city of Toyota.